HOW FARES SHIMLA’S HOSPITAL NO 1? Even after four decades of its existence, Indira Gandhi Medical College (IGMC) here has failed to develop super-specialties, which exist only in name as majority of serious patients are referred to PGI, Chandigarh, or other institutes outside the state. Being the state medical college, patients from all over Himachal come to IGMC for treatment but the acute shortage of specialists has hampered the growth of super-specialties like neuro-surgery, nephrology, gastroenterology and paediatric surgery. The government on the other hand expresses its inability to launch super-specialties by saying that specialists prefer to join the big corporate hospitals rather than government institutes. The lone feather in its cap in the recent years has been the starting of the open-heart surgery at the Cardio Thoracic Department. This step alone has gone a long way in helping the poor and the needy, who otherwise are unable to take treatment for various heart ailments due to the cost factor.
. It was noted cardiologist Dr Venugopal under whose guidance the open heart surgery facility was started at the IGMC. In fact, he had performed the first few surgeries when the facility was started here.
. It is a 765-bed hospital, and has 32 faculties with over 80 consultants. The total strength of doctors working in various capacities is over 450. It has a full-fledged regional cancer centre which can boast of having oncology and nuclear medicine faculties. Another step which has given a lot of respite, especially to the poor has been the installation of a MRI machine, about a year ago. Prior to this, patients had to go to Chandigarh to get an MRI scan, which can now be done here and that too at much cheaper rates as it is subsidised for the poor and weaker sections. Though there is some waiting for an MRI or CT scan, but even then it is very helpful for the poor patients.
. The Regional Cancer Centre was started in the year 2000 is presently treating 1,700 patients.
. The Radiotherapy Department at the IGMC was the first medical college in the country to be given the status of a regional cancer centre as it has been running its radiotherapy department since 1977.
. Except for the 500 cancer patients from areas like Una, Nalagarh, Nahan and other border areas of Himachal taking treatment at PGI, rest all are being given most of the services at the Regional Cancer Centre.
. All cancer patients are given complete treatment free of cost and even the expensive chemotherapy drugs are provided free to all the IRDP and below poverty line patients.
. Travelling has been made free in Himachal roadways buses for cancer patient and attendant. Another area, which needs much improvement, is the casualty of IGMC, as it reflects the image of any hospital. With no separate registrars from the main faculties like orthopaedics, surgery and medicine deputed in the casualty, the patients are only given basic treatment. Though consultants are on call duty, but precious time is lost in case of trauma cases, where every minutes matters in saving lives. The hospital has however, been able to start a six-bedded intensive care unit (ICU) with latest infrastructure, a year back. The departments of neurology and gastroenterology do not have a single consultant, while the faculties of nephrology, paediatric surgery, neuro-surgery and urology have one consultant and only skeletal staff. Many other departments too have acute staff shortage right from the doctors to other para-medics. “The least that one expects when one opts for serving in a government hospital is professional satisfaction and recognition but when one does not get his due even after rendering good services it is very frustrating,” said a senior doctor. He says that many good doctors have left IGMC due to frustration and lack of professional growth. Though subsidised tests are being conducted by the micro-biology, pathology and bio-chemistry departments but there is a lot of scope for improvement. Some of the tests like tumer markers or immuno-histo chemistry reports which are a must in haematological analysis in cancer patients are not available and patients have to spend a lot in private labs. The authorities hope to start the much-needed trauma centre at the hospital shortly. This will be very beneficial in saving accident patients, who are critically ill. It was after spending almost Rs 27,000 for a simple biopsy test at a private hospital in Pathankot that 62-year-old Dev Raj, resident of Langera village in the Kehar area of Chamba, decided to come to IGMC. Suffering from blood cancer, he says the entire treatment, including all tests and chemotherapy, has been done free of cost so far. “I was told by the private doctor at Pathankot that he had operated on me for a tumour and that now I needed to go to either Jammu or Shimla for the treatment,” he says.
. Shortage of consultants and specialists is affecting the services being provided at the hospital.
. The shortest approach road from the Cart Road to the IGMC via Cancer Hospital has been closed for the last six months. The work of erecting a retaining wall at the site has been going on at a snail’s pace, as a result of which patients as well as doctors and other staff have to drive 5 km extra to reach the hospital via Sanjauli.
. With all educational institutions in Shimla being closed for almost three months during the winter, it is the blood bank at the IGM, which bears the brunt. The situation in these months is very grave as most of the voluntary donors are out of Shimla.
. Open heart surgery has proved to be a boon for needy patients. This step alone has gone a long way in helping the poor, who otherwise are unable to take treatment for various heart ailments due to the cost factor.
. So far, almost 90 per cent of the money for about 150 such surgeries done so far has come from the Chief Minister’s Relief Fund. If the plains have flyovers, the hills have tunnels. A tunnel is an underground passage way. In general, tunnels are enclosed on all sides with openings at each end and at least twice as long as they are wide. Since 1945, five tunnels of Shimla town, two of which are dysfunctional presently, fit into this definition. Ravenswood, which was pulled down to construct the multi-storied Shimla High Court building, was one of the oldest buildings in Shimla. It is believed that Ravenswood was built a couple of years earlier than 1850 in which year A.O’Meara, the renowned dental surgeon, started living there. When Bemloe, a government locality with 32 cottages, came up in 1922, a shorter way to The Mall was planned through a tunnel with one of its ends close to Ravenswood. This 65-foot-long tunnel was a boon for the pedestrians footing the way from the cottages to The Mall and remained so for 74 years, but in 1996 when the new building of the high court was under construction, it had to be dismantled due to security reasons. Reduced to a length of about 10 feet, it is being used today as a private path to the basement of the high court building. The other one, Elysium tunnel, about 120 feet in length, built in 1905 stands sealed since the summers of 2007 paving way for a new tunnel for vehicular traffic by its side so that the Longwood loop of the circular road could be avoided by vehicles going to Kaithu side, thus, keeping the students of a college and two schools away from the traffic hazard besides shortening the distance by a kilometre. The Lower Bazaar tunnel runs north and south and was 500x10x12 feet in dimension. When Gunj Bazaar used to export foodstuff to the neighbouring princely states, there was considerable movement of mules and coolies and the English abhorred this traffic passing through The Mall and so got the tunnel and the Sanjauli-Kaithu road built in 1905. It was called Khachhar Surang. The tunnel has Saudagaron ki Masjid, the main mosque of the town, right above it. There were shops including Hakimmal Tanimal, renowned clothiers, on its proposed extremity on the Lower Bazaar side and for displacing them, a compensation of Rs 50,000 was paid. Time gradually told on this about a 100-year-old tunnel and the Municipal Corporation in the year 2000 took to rejuvenate it. It was re-dedicated to the denizens after a closure of one year with width reduced by about a foot on each side and so called improved lighting system. The oldest tunnel here is one that connects Sanjauli with Dhalli ‘through which every visitor to Mashobra or Mahasu of necessity passes’. This 560-foot-long tunnel was commenced by Major Briggs in 1850 and completed in the winter of 1851-52 with the efforts of 10,000 prisoners and 8,000 forced labourers. It was like a dark hole through a solid rock. Its darkness used to be lessened by regular whitewash and six ‘miserable lanterns’ lit on sunset. Lord Kitchener, the Commander-in-Chief of India 1902 onwards, had secured lease of Wildflower Hall, where stands Oberoi’s hotel of the same name today. He used to horse-ride to his official residence Snowdon. One evening he was returning to Wildflower Hall when his horse shied slightly. Kitchener’s foot caught against the side beam; there was a twist and wrench and both bones of the leg above the ankle suspended. The Commander-in-Chief lay in the cold, damp and dark tunnel for half an hour. Luckily Jenn, a European, saw him and he was brought back to Snowdon to be operated upon. The tunnel later was widened and electrified. The pessimist sees only the tunnel; the optimist sees the light at the end of the tunnel; the realist sees the tunnel and the light and the next tunnel. the construction and opening of Victory tunnel in 1945 that joins the Railway station and the main Bus stand with Shimla that falls on the north. It was opened immediately after the celebration of victory of the allied forces over the axis powers on May 8, 1945. It is the widest and light-friendly tunnel. Shimlaites may see, in near future, three more tunnels to be built under the Jawaharlal Nehru Urban Renewal Mission to avoid traffic jams that often plague the town. Despite the fact that the entire Dhauladhar Range in Himachal Pradesh falls in the most sensitive earthquake-prone areas, haphazard and unplanned construction of residential houses and other buildings is going on unchecked. In the past five years, Kangra district, particularly Palampur and Dharmsala towns, have turned into huge concrete jungles. After the 2001 earthquake in Gujarat, the Himachal government had taken steps to regulate the construction activity in the region and brought important towns of Kangra district within the purview of Town and Country Planning Act. However, it is surprising that hundreds of buildings, including residential houses and multi-storeyed complexes in the district have come up without prior approval of the town and country planning authorities. There are several hotels in the region that have been constructed in gross violation of the rules laid down by the Town and Country Planning Department. In many cases, buildings have come up even without the site plans being approved. Defaulters have managed to get even electricity and water supply connections. Not only private parties, but also semi-government and government agencies have not followed the norms laid down by the Town and Country Planning Department. A large number of buildings constructed by municipal councils, the Public Works Department and other government agencies have come up in violation of norms. It was the pioneering aspect that fired the imagination of the world. 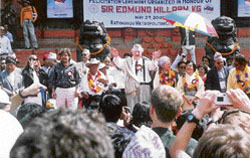 The ascent of Everest was matched only by the moon landing in the effect these events had on two generations in the 20th Century. My own favourite Hillary story is about an incident many years after the conquest of Everest. The pilot of a flight in north India pointed out Everest to his passengers. A few minutes later, the airhostess came into the cockpit with a note from a passenger saying the pilot had pointed out the wrong peak as Everest and correcting the mistake. The pilot sent the note back with an abrupt sentence saying he flew this route regularly and knew which one was Everest. While the new traffic regulation at Hamirpur has given a new look to clogged roads of here, this initiative has also changed the priority of the traffic police here. The district police after doing its home work for quite some time swung into action few days back to make the town congestion free and to bring perceptible changes according to the growing traffic needs of the residents. To remove traffic congestion in the main bazar here, the police has shifted the vehicles parked at Gandhi Chowk to other near by places. The traffic in the market is regulated during peak hours, especially when schoolchildren come and go back from schools. Entry of vehicles has been stooped in the bazaar during these hours besides restricting idle parking in the market. To keep a proper check on any traffic violation close circuit cameras have been installed at Gandhi Chowk. The police has also created a separate traffic police wing with separate police strength. National highway petrol and mobile traffic vehicles will be moving round the clock in the areas of traffic concentration. District police is also trying to create awareness amongst the public and soliciting their support in new traffic regulations in the town. There is no full-time physiotherapist available for the treatment and training of the physically challenged children under the home-based programmme meant for their education and training under the Sarva Shiksha Abhiyan (SSA) in the state. Over 2,100 physically challenged children can not walk, can not move their limbs properly and are still spurned as “handicapped” even years after the SSA launched its home-based-programme in the state for their education and treatment. Parents find themselves unequipped and untrained in handling them. The centrally-sponsored SSA has covered around 420 such children in the age-group of 6-14 years under its home-based programme involving over 12 NGOs to give them “special care” in the state, But still there are over 1,700 such children, who continue to fend for themselves as the SSA is yet to reach out to them. These children need physiotherapists to train them in their basic daily activities, so that they can live a better life. But the SSA does not have a physiotherapist on job to provide them the need-based quality care and training. Dr Sharad Malhotra, a private physiotherapist, in Mandi hired by the SSA to train resource trainers to educate the special children said, “These children suffer from musco-skeleton problems due to premature birth or by accidents or have congenital physical defects or delayed milestones. They need special care and needs-specific training so that they can live a self-supportive life”. Malhotra said they need special therapy to overcome their handicaps in both upper and lower limbs. “Even they need occupational therapy so that they learn work-related activities, which can be provided by the trained care-givers”, he added. The SSA has identified over 26,268 special children in the state. Out of these about 24,000 are enrolled in government schools and study like normal children, the care givers said. But still over 1,700 severely challenged remain virtually fending for themselves as the parents are poor and not trained enough to manage them at homes. The SSA has yet to cover them under its home-based programme. SSA project director P.L. Negi said they have covered over 420 children under the home-based programme provided by the NGOs in the state. “We have trained over 920 trained special educators to provide training to such children, who have been left out. Children with mild defects are taught in normal schools so that they learn the normal behaviour”, he added. Negi said the SSA was covering even children with five per cent physical defects. The trained educators at each district-level training center - DIETs, provide training to children in the age group of 6-14 years. 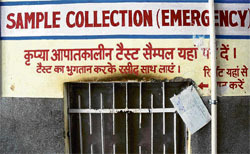 The local municipal corporation (MC) is keen on making money even if it brings inconvenience to the public. This is precisely what is happening as people are being made to wait for long hours at the shooting site near the Willows Bank hotel, here on the Mall Road. Nobody has a problem with the shooting taking place, but it should not hinder the movement of the public and vehicles. For the past one week, the shooting of Sujit Sircar directed film ‘Shoe Bite’ has become quite a pain for the residents as well as tourists. Rather than being apologetic about causing inconvenience to the people here, the private security of the film unit has not even hesitated in roughing up the people. Some tourists as well as local photojournalists got a taste of their starry ways when they were manhandled by the security at the site of the shooting. The local cops, too intimidated by the Bollywood presence, remain mute spectators, whenever, there has been a problem at the shooting site. The worse is when pleas by the public that they have to reach the hospital or a bank or tourists wanting to reach on time to catch their train or bus too fall on deaf ears. They are made to wait as the shot is being taken. “The moment the shot is okayed you can go in five minutes,” say those on the sets, but invariably this time stretches to at least half-an-hour. Notwithstanding the fact that superstar Amitabh Bachchan and Diya Mirza are starring in the movie, the people are waiting for the film unit to pack and leave the town as early as possible. Having imposed a ban on holding of public meetings and functions on school premises, the government has now decided to be strict with teachers found using cell phones in classrooms. The government has taken a serious view of the use of cell phone by teachers in classrooms. Now heads of various educational institutions have been directed to instruct the teachers not to use cell phones while in class rooms as it disturbs the students and is against the norms. The principals have been asked to observe strict compliance of these orders as disciplinary action could be taken against the defaulters. “Teachers must work with dedication and sincerity and while in school time must be spent on imparting knowledge to students,” said a senior functionary. He said holding of public meeting and functions on school premises had already been banned during working hours as children were forced to attend these. It was a common practice in the past when children would be made to stand on roadsides to welcome dignitaries. The government has already issued strict directives that community lunch will not be served in schools, besides, holding public meetings and functions on working days. He, however, added that educational institutions were at liberty to hold functions, sports events and extra curricular activities in schools. After personally seeing the filth and dirty condition of the Himachal Road Transport Corporation (HRTC) buses, the transport minister, Kishan Kapoor has issued special directions to all the senior officers to ensure that the buses in their circle are kept clean. It was on his visit to the ISBT, Delhi that he saw the dirty condition of the buses. Since people have to undertake long journeys on buses it would be nice if the HRTC tales the pain to provides them neat and clean buses, making their travel more comfortable. It was following this announcement that the Kangra tehsildar was asked to camp himself along with the staff at Nagrota Bagwan every Tuesday and Friday. Lekh Ram, tehsildar, Kangra, said only affidavits were being attested and certificates issued at Nagrota Bagwan.